This plastic tote bag is great for carrying purchased items and for carrying papers gathered at meetings and conventions. On one side is the DEA Badge with the Get Smart About Drugs website. 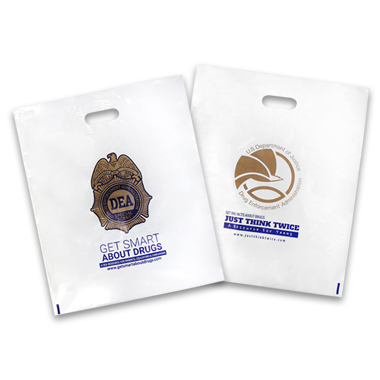 On the other side is the DEA Seal with the Just Think Twice website. Bag measures 15"w x 18"h x 4"d.